It's time to start gardening! 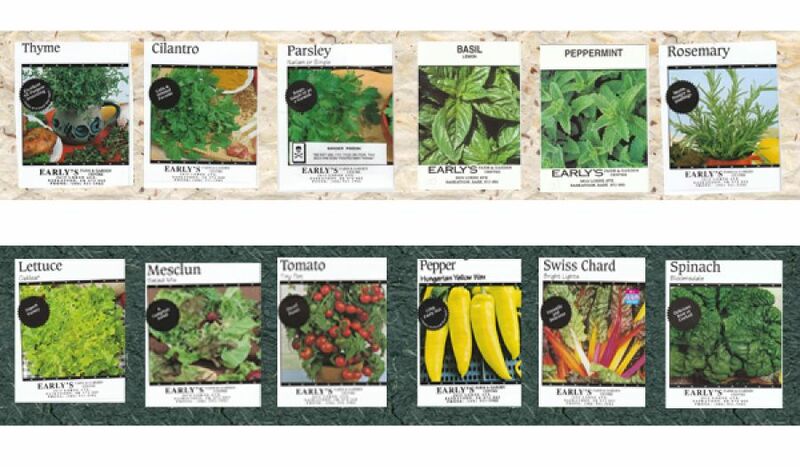 Though it may not seem like it with these abominable temperatures, it's time to start some of your seeds! With our short growing season some of your favourite flowers and vegetables need a head start, as early as January! 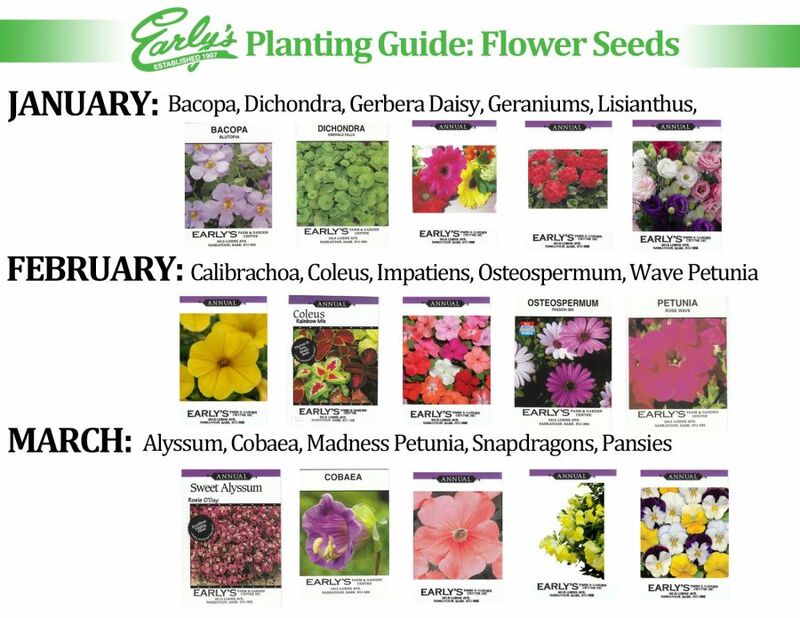 Use these little calendars to keep track of when you need to start what seeds in order to help them fully mature this year. All Flowers and Vegetable not on these calendars can either be started in April or planted directly into your gardens. Please note that vine plants don't particularly like to be transplanted, so it's always best to plant them directly. As an avid Gardener, do you find yourself bored on a rainy day when you can't get out and spend time pampering your plants? Here is a list of ideas to keep you busy amidst the sweet summer rain! Uproot hardy weeds like dandelions while the soil is wet. It’s much easier. Help water logged potted plants to dry off by removing trays from under them, and placing them somewhere out of the rain to drain off. Cover delicate or young plants, or move them to shelter if they’re in a pot. Collect rainwater in bottles, buckets, or watering cans to feed to your houseplants; or pop them all outside for a quick drink when the rain is gentle. Go on slug and snail patrol! You can pick them off by hand, or lay down deterrents such as coffee grounds or crushed eggshells. Turn the compost heap. Mix up the wet and dry layers. Collect and dry off any seeds you want to save for next year. Clean and tidy the shed, green house, or garage. Also take this time to clean any garden tools and empty pots. Start planning next year’s garden. Think about ordering seeds and bulbs now. 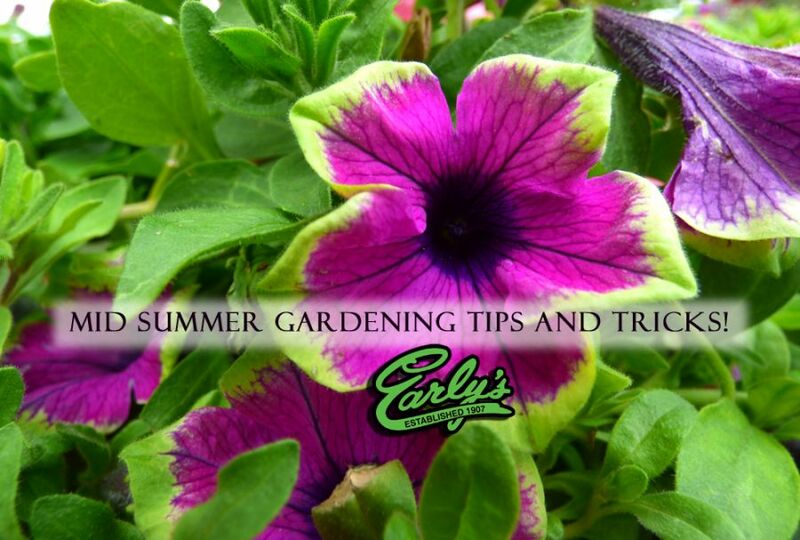 Come See Us at Early's for all your Gardening needs and ideas for the future! Grow Fresh Greens All Winter Long! The weather outside is frightful, and fresh greens would be delightful! Growing a garden indoors this winter is easier than you think. Some key concepts to keep in mind are light sources, soil temperature, and the type of vegetable. Light: Large windows and skylights are essential in stimulating growth. If you don't have excellent natural light sources in your home you should consider buying grow lights. A full spectrum light will simulate the missing sunlight. To see our selection of grow lights click here. Temperature: Warm inviting soil is a necessity. Placing your germination tray near a window is a great source of light. However, your window may let in too much cold air chilling your soil and preventing successful germination. A simple heat mat can solve this problem. Heat mats keep the soil at an easy 70 degrees Fahrenheit. Another option would be to place your trays on top of a warm surface ie. your refrigerator. To see our selection of heat mats click here. Fall Garlic! How do you plant it? It’s hard to believe, but it’s that time already – time to start ordering and prepare for planting garlic! Here are some instructions for planting garlic and how to order the right amount. Already know what you need? Garlic is best planted in the fall for harvest the following summer. It can be planted in spring, but this will result in lower yields and is not recommended, as cloves that have not been exposed to temperatures below 65 degrees may not form bulbs. Garlic is very cold-hardy and starts growing again early in the spring after planting. Hardneck garlics produce flower stalks called scapes in early summer. The scapes should be cut to encourage larger bulb development and are also a popular food and marketable product. Garlic bulbs are then ready to dig and cure around mid to late summer, after the lower leaves have dried down. The best time to plant garlic depends on where you live – but generally it should be planted between the end of October and end of November, after the first frost but before the ground freezes. Our garlic ships between October 6th and 15th, and sells out every year – so if you’re thinking about planting garlic this fall, now is the time to order. Whether you’re a Music lover or a Spanish lover, don’t get your heart broken when they sell out! 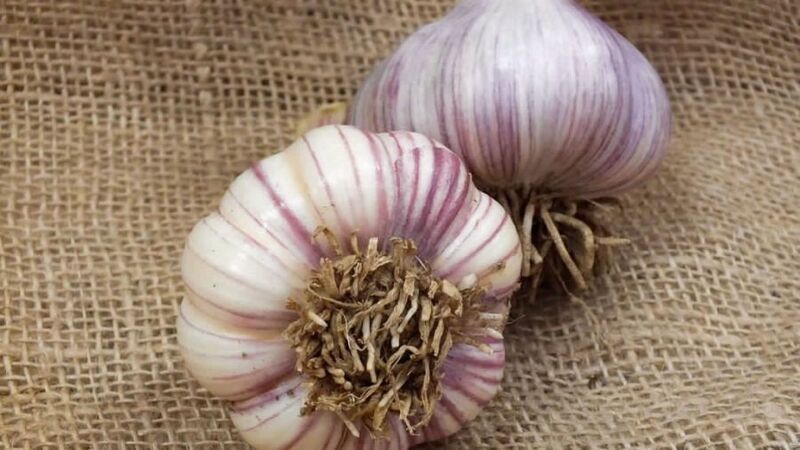 Garlic prefers soft, loamy soil with good fertility and likes to be covered with a thick mulch. A thick layer of straw mulch laid down after planting helps prevent the garlic from “heaving” out of the soil when the ground freezes, and will also help keep down spring weeds. Separate bulbs into individual cloves right before planting, being careful not to break off the basal scar, which protects the bulbs from rotting. Plant each clove with the basal root end down, and pointed tip up. Larger cloves will produce larger bulbs with fewer cloves, while smaller cloves will produce heads with more small cloves. Small cloves, especially those found on softneck bulbs, can be sown in the fall at a close planting density for garlic greens. For most hardneck and softneck varieties individual cloves should be planted 2″ deep (if mulching) or 3-4″ deep (if not using mulch), with the cloves 6″ apart in rows 18″ apart. Elephant garlic requires a wider spacing of 8-12″. The amount of space that can be planted from a bag of garlic depends mainly on how many cloves are in each head for that variety. Softnecks weigh about 2.25oz/bulb, so you get about 50 seed cloves/lb with roughly 7-10 seed cloves/bulb. For a 10 foot bed with 3 rows in it, you would need 60 cloves or a little over 1lb. That translates to about 60,000 cloves/acre (~1,200lb/acre) using 6” bulb spacing and 18” row spacing. Hardnecks weigh about 2oz/bulb so there are about 40 seed cloves/lb with 4-7 seed cloves/bulb. Since hardnecks and softnecks use the same spacing, the number you need is the same – about 60,000 cloves/acre using 6” bulb spacing and 18” row spacing. However the weight of garlic you need will be different, about 1.5 lbs for a 10 foot bed or 1,500 lbs/acre. We are well into gardening season and as things move along we have some house cleaning to do! These little tricks will help your garden flourish to its fullest potential for the rest of the season! Water the garden from below early in the day to control powdery mildew on cucumber, squash, and pumpkin. This way there is no moisture on the leaves when the temperature drops in the evening.